Retirement communities offer specific amenities that cater to the over 55 crowd. Investing in a home in one of these communities has its pros and cons. While you are able to target a very niche group of people, you may be limiting yourself, as these communities are much more common in certain areas of the country. Here are the positives and negatives of investing in this type of property. There are several positives of buying a retirement home as an investment property. Baby boomers are retiring every day and are looking for the ideal place to spend their leisure years. Here are seven things you should consider. Desirable Areas: The first perk of investing in an over 55 community is the weather. These homes are typically located in warmer climates, such as Florida or California. The great weather is a selling point in and of itself. Not only can you go and check on your property investment, but you can also take in the sunshine while you’re at it. In addition to being located in warmer climates, retirement communities are typically located close to an active city or college campus. Not only does this mean that there are many activities nearby, but it also means that there is likely quality healthcare as well. It is common for retirement communities to be located near universities which are known for their stellar health care programs, such as Johns Hopkins or UCLA. Aging Population: Members of the large baby boomer generation have approached retirement age and are looking for a place to call home in their later years. Not only that, but people are living longer than ever before. Retirement communities are a great place for this aging population to settle down for years to come. Maintenance Included: When buying or renting in a retirement community, monthly fees often cover homeowner maintenance. Every community will differ, but these fees can cover everything from housekeeping to exterior yard-work. Having outdoor space, but not having to maintain it, is attractive to this aging population. Target Market: When you invest in a retirement home, you have a very specific target market. 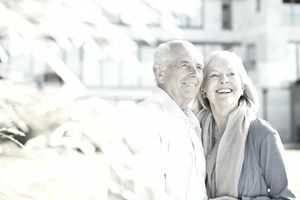 Since most retirement communities require residents to be 55 or older when looking for buyers or renters for your property, you know who you are targeting and you can develop a marketing plan which will appeal to this demographic. Amenities: There are numerous amenities available in retirement communities. From exercise classes, educational courses and recreational activities, there is always something to do in the community. Quiet Community: Many retirement communities are gated and are not accessible to street traffic. In addition, the average home size is only one or two people, so the amount of noise in the community is at a minimum. Less Wear and Tear: There will only be one or two people living in the home, and no children, so there will be less wear and tear on the property. There are also negatives to consider when purchasing a retirement home as a property investment. You are limiting yourself to the over 55 segment of the population, which takes away anyone under that age as a potential renter or buyer. Here are three things to be aware of. Monthly Fees: While there are some communities that don’t require it, in most retirement communities, you will have to pay a monthly fee for the retirement home. What the fee covers will vary by community, but it can include utilities, yard maintenance, and housekeeping, for example. As an owner, you will have to pay this fee regardless of whether you are able to find a renter for your property. Niche Market: Buying investment property in a retirement community limits your potential buyer or rental pool. You usually have to be at least 55 years of age to reside in the home, so this type of investment immediately cuts out a large portion of the population. Limited Investment Properties: Retirement communities are not found in every neighborhood. As spoken about above, there are specific areas where these homes are commonly located. In addition, inside the actual community, there are only certain types of investment properties available. These are usually a single family home or a condominium.